On the approaching climax of the Windows 8 consumer preview launch in hope-for Windows 8 OS by the Microsoft on the special leap day of 2012, Windows 8 book is scheduling up the pre-order of the book, "Mastering Windows 8" by William Panek, the best selling writer in the stream of computer technology to fulfill the anticipation of the enthusiastic Windows OS buffs. "Mastering Windows 8" one more feather to the cap of Windows 8 books offers profound guidance to be mastered in the forthcoming Windows 8 architecture. If you belong to the power user category or star-studded IT sector the book, "Mastering Windows 8" explores you thoroughly with step-by-step description of every section, practical illustrations and advanced networking elements. This yet-to-release technical version of Windows 8 seems to be an essential addition to adorn your tech library if you would prefer to attain professionalism in Windows 8 that updates you in view of its reference reliability feature. Distinctive features of the book, "Mastering Windows 8"
Enhancing the knowledge of the power users and IT managers to garner the most out of the Windows 8 on the horizon. Mastering your skills through instructive steps along with matter-of-fact illustrations and enough workouts. Elaborating the most significant elements to include command line, GUI, PowerShell operations, and new variants of Windows 8 as well. Exposing you to advanced networking and other updated technical matters. Empowering the professional touch of Windows 8, the prospective MS OS entirely. Regarded as one of the best-selling tech literate, William Panek who compiles the book entitled as "Mastering Windows 8" descends from the city of Farmington, New Hampshire in the United States. A couple of his bibliographies includes, "Windows Server 2008 R2 Complete Study Guide," "Windows Server 2008 Active Directory Configuration," "Mastering Microsoft Windows 7 Administration, "Microsoft Windows 7 Administration Instant Reference," etc., and are notable compilations, I need to say. Yet to be released on August 21, 2012 and review awaited, the book is ready for pre-ordering with guaranteed pre-order price and the price quoted at $31.49 free of super savvy shipping cost, carted by the Amazon.com. 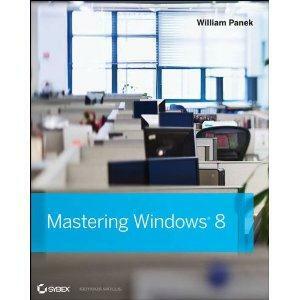 The book "Mastering Windows 8" is a paperback edition extending up to 720 pages from the Sybex publishing house. For those who adore becoming a professional in the Windows 8 "Mastering Windows 8" is indispensable to start with. You can pre-order just over a click on the Amazon.com to acquire the book at a pre-order ensured price.